Scratch one more thing off my list of things I want to experience in my lifetime. I spent $10 on a pet psychic who had her booth at the Pet Fest. I don’t want to brag too much about our weather today in Pensacola, Florida today because in time it will be our turn to bundle up for the cold. Today Levi and I attended a Pet Fest at Gulf Breeze, Florida where we did a square dancing demo with other members of the Five Flags Dog Obedience Club. By noon I had removed my jacket and sweater and just had on my jeans and a club t-shirt. I was worried about my black dog’s comfort in the 70+ degree sun. Picture me purring like a cat. Sun without humidity makes this lady very, very happy even if it does make the dogs grumble. However, this week I did see all three dogs in the kennel sleeping outside on the warm concrete. Scratch one more thing off my list of things I want to experience in my lifetime. I spent $10 on a pet psychic who had her booth at the Pet Fest. 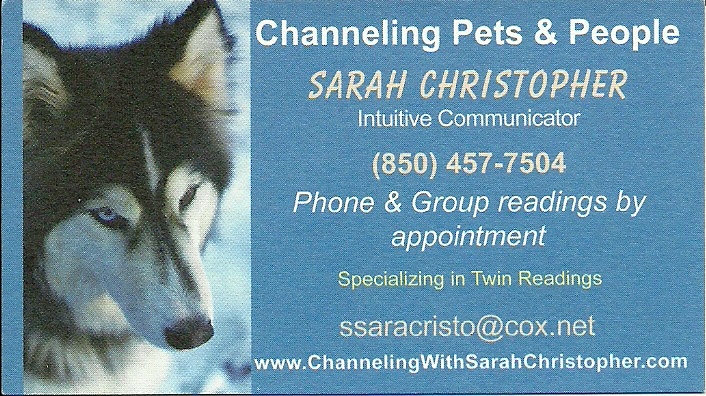 Her name is Sarah Christopher who is affiliated with the Mystic Cottage in Pensacola. She reeled me in when I walked by her booth by mentioning that the number eight factors heavily with my dog. When I sat down she said a dog I owned who has passed on, possibly at the age of eight, is looking over me. She wasn’t quite sure if that was how the number factored in to my life but said it may play an important part in my future. Handing me a card, she asked that I email her if she was right. Levi is not shy and loves shoving his black and white nose into people’s face for a sniff and a lick. Sarah put her hands on Levi’s head and snuggled him. She said something about him being very healthy and that he feeds off my energy. Then she said that someone in my life was confronting me angrily and the negative energy was hurting me spiritually. If she only knew that taking care of my parents with their Alzheimer’s and dementia problems can crush anyone’s spirit. It always weights heavily on my mind. She asked that I not tell her the specifics but advised ways to remove the negativity until that time in my life when that person is gone. Then I will be at a more peaceful place. We talked about Levi’s health. She felt no problems. Sarah told me I had two other dogs. (Now how did she know that?) She said Levi says he is the dominant dog but the other dog (I’m guessing probably old dog River) tolerates Levi. There is no fighting between Levi and River but the positioning is constant. Sarah asked how I spend time with Levi, although she commented on how well trained he is and how much time I must spend with him. I told her about his obedience career. She said he would like to be doing agility. That looks like fun to him. I asked Sarah if Levi enjoyed showing in obedience. She replies that I am nervous at shows and that causes him some concern but overall he enjoys showing. Well, she got that one hundred percent right! Before I left Sarah commented that I am a metaphysical person, which intrigued me. Sometimes I feel an almost unnatural bond with my pets; but rarely with humans. Sarah said the dogs don’t speak to her in words but with emotions and pictures. I understand that concept as I feel their hunger, thirst and fear immediately even if I’m in a different room. This is a topic that scientists and dog trainers have been arguing for a long time. Is there a spiritual connection with our animals or is it just a repetitive relationship that makes it easy to relate to them? I saw Levi use his nose today to scent two horses being ridden by police officers. He moved from under the club table to see the horses clearly. Was his nose deceiving him? What beast was in the vicinity? When he got a visual of this large “dog” standing about fifty feet away he cowered behind my chair. I made him lie down in the shade beside me which took his mind off the horses. As they moved away he forgot them. Dogs live life in the “now”. Out of sight, out of mind, is a good philosophy when it comes to the fear of the unknown. Anyhow, now that I saw how powerfully Levi used his nose to determine something unknown I know he has the capability to use his nose to scent a measly little Utility article a few feet away. So far I’ve never seen any horses in the obedience ring either so there should be no interference from their heavy odor. Then again, you never know what other smelly monsters lurk ringside. This entry was posted in border collies, Dog training, Retirement Life and tagged Alzheimer's, Border Collies, Dog training, Florida. Bookmark the permalink.